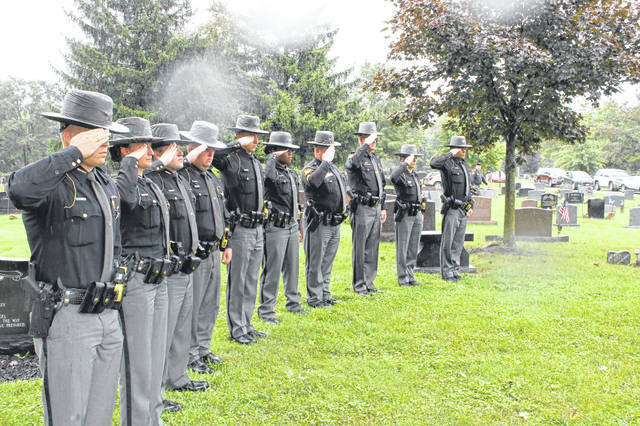 Deputies from the Delaware County Sheriff’s Office salute during Jackson’s funeral in Oak Grove Cemetery on Saturday. Delaware County bid farewell on Saturday to Eugene T. Jackson, former Delaware County sheriff and Korean War veteran, during a funeral in Oak Grove Cemetery. Jackson, 88, passed away on Sept. 4, and a visitation and funeral were held on Sept. 7 and Sept. 8, respectively. Current Delaware County Sheriff Russell Martin and numerous Delaware County Sheriff’s deputies attended the funeral. Jackson was born in Mazon, Illinois, on July 21, 1930, and he enlisted in the U.S. Army at age 17, where he served as sergeant in the 24th Signal Company in the 24th Infantry Regiment during the Korean War. Jackson was discharged after three years of active duty and married his wife, Edith, in 1951. He was awarded a Bronze Star for his service during the war. 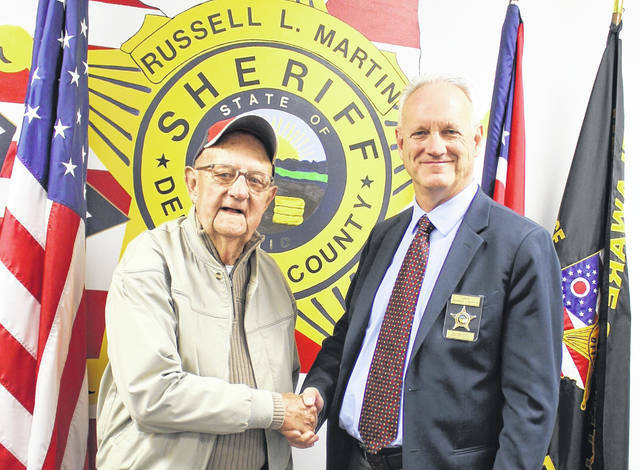 Jackson became a Delaware County Sheriff’s deputy in 1954, and he was elected to serve as the Delaware County Sheriff in 1966, an office he held until 1976. Jackson oversaw the creation of the Delaware County Mounted Unit in 1967, which has been assisting in events with big crowds such as the Delaware County Fair for the last 40 years. Jackson also oversaw the foundation of an Emergency Medical Service after a change in 1972 required the sheriff’s office to also serve as medical transports and perform emergency runs as well as arrests. A separate EMS department was created by Jackson’s successor, Sheriff Bill Lavery, in 1978. The Delaware County Sheriff’s Office reports that Jackson was the last Delaware County Sheriff to live in the Delaware County Jail, along with their wards. The sheriff’s office reports that at that time, the jail was located at 22 Court St. and was in such poor condition that large chains had to be wrapped around the cell doors to keep the inmates inside. According the the sheriff’s office, Jackson once discovered that a prisoner had escaped three times by using a saw made from a metal spoon to break the chains around the door. Jackson is survived by a son, Bradley Jackson of Delaware; a daughter, Kimberly and Russell Joan of Mount Gilead; grandchildren, Barry Jackson, Shelley Jackson, Amy Workman and Aubrey Mayle; great-grandchildren, Sarah Noel and Levi Workman; and a brother, Auvil Jackson of Powell.